Worldwide, beef exporting countries are keeping the protein pipeline flowing. Here’s a breakdown. It’s been a good run for beef exports this year. Global beef exports for the first half of 2018 were up 9% year-over-year with higher volumes from all major exporters except for the European Union. The collective total for the world’s top beef exporters was 3.294 million metric tons (mt). Brazil was the volume leader at 669,000 mt (+5% from a year ago) followed by the Australia (639,000 mt, +16%), the United States (630,000 mt, +10%) and New Zealand (284,000 mt, +3%). The U.S. Meat Export Federation’s (USMEF) detailed summary of first-half U.S. beef exports is available online. Argentina is this year’s pacesetter in terms of growth rate, with first-half exports up 40% to 210,000 mt. China/Hong Kong (99,983 mt, +72%) took nearly half of Argentina’s export volume, but Argentine beef also achieved strong first-half growth in Russia (43,885 mt, +85%) and the EU (21,894 mt, +17%). 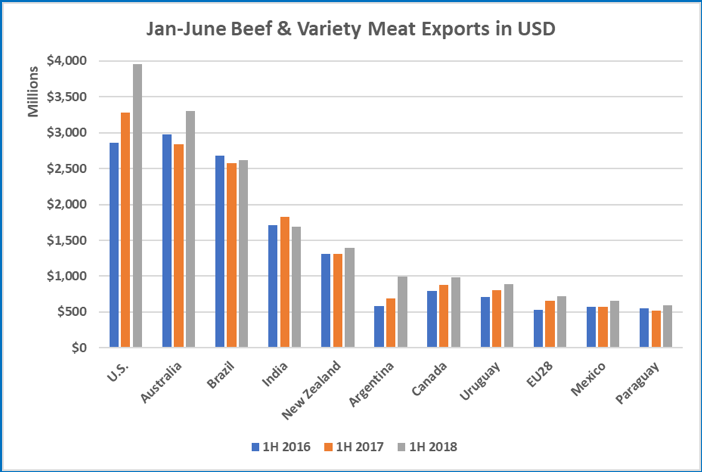 For chilled beef, the United States remains the world’s leading exporter at 223,000 mt, up 8% year over year, followed by Australia (141,000 mt, +10.5%). U.S. chilled beef exports were higher for nearly all top markets including Japan (74,000 mt, +4%), Mexico (59,000 mt, +13%), South Korea (25,000 mt, +35%) and Taiwan (11,000 mt, +34%). The exception was Canada, where U.S. chilled exports slipped 4% to 36,000 mt. First-half export value grew at an even faster pace among leading exporters, increasing 14% to more than $16 billion. This was led by the United States ($4 billion, +21%) and Australia ($3.3 billion, +17%), with Brazil’s exports ($2.6 billion, +1%) also increasing modestly in value. Even when including an estimated first-half decline for India ($1.69 billion, -8%), the top exporters’ collective total still climbed 12% year over year to $17.8 billion. Other notable first-half value totals included New Zealand ($1.39 billion, +6%), Argentina ($989 million, +44%), Canada (980 million, +12%), Uruguay ($893 million, +10%) and Paraguay ($596 million, +14%). EU export value increased 11% to $725 million, even as volume declined 8% to 218,000 mt. Through May, Mexico’s export value was up 14% to $536 million. For the world’s leading beef importers, first-half volume climbed 11% to 3.38 million mt. China (477,050 mt, +33%) and Hong Kong (433,753 mt, +39%) were the top growth markets and accounted for the bulk of increased trade. However, increases for Indonesia (96,214 mt, +39%), Korea (237,510 mt, +9%), the EU (126,230 mt, +14%), Chile (105,120 mt, +11%), Mexico (estimated at 98,450 mt, +4%), Canada (93,272 mt, +6%) and Taiwan (61,700 mt, +9%) also contributed to this strong growth. Egypt (133,800 mt, +6%) rebounded from last year’s low volume, while imports also increased modestly for the United States (540,954 mt, +1%) and Japan (321,450 mt, +2%) and were steady for Russia (211,000 mt). Vietnam’s imports declined 2% to 363,362 mt. 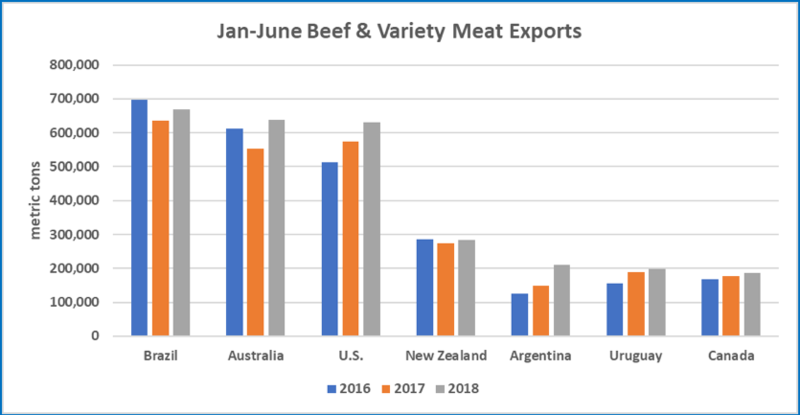 Global economic growth has underpinned beef demand in 2018, and lack of domestic supply in several key import markets means consumption growth must be met through imports. It is also important to note that with drought intensifying in key production areas, beef supplies could tighten in the near to medium term. Editor's Notes: Except as otherwise indicated, first-half results exclude India, which has only reported exports through May. Import results are based on estimates for the leading importers. Results are based on Global Trade Atlas data and USMEF estimates. HS 0504 variety meats are excluded from Global Trade Atlas data, which is why it differs from the USDA data used in USMEF’s summary of U.S. exports.